An IBM team led by researcher Yu-Ming Lin has incorporated a graphene transistor into a frequency mixer, demonstrating the potential for integrated circuits whose speeds can be thirty or more times faster than current silicon-based chips. “The frequency mixer is one of the basic building blocks of analog electronics, and wireless communications in particular,” says Lin. They are used in cell phones to mix the radio signal, which carries information, with a reference signal to generate audible sound. Lin’s success shows that graphene can be used to make faster, more power-efficient versions of circuits commonly used in wireless devices. Lin’s group used standard manufacturing techniques to create their circuit, suggesting that graphene devices can be made commercially viable by scaling up production economically. “This is really exciting work and it points to the rapidly approaching future of graphene electronics,” says James Tour, professor of chemistry and computer science at Rice University in Houston, Texas, who was not involved with the work. Graphene is a single-atom-thick chicken-wire mesh of carbon atoms that conducts electrons thirty times faster than silicon. Graphene’s promising properties were first demonstrated in 2004 but graphene circuits have defied efforts to build using existing manufacturing technology. Graphene transistors can operate at 300 gigahertz, or 300 billion cycles a second while today’s best silicon transistors are only one-thirtieth as fast. Lin’s group had to overcome the difficulty of combining graphene transistors with other materials. Graphene transistors become unreliable when positioned too close to certain metals, making it extremely difficult to put them on a single chip with other components. Therefore, past efforts at combining graphene with other materials has led to circuits with degraded performance. Lin overcame this by making sure the graphene didn’t come into contact with other materials by putting arrays of graphene transistors on the surface of silicon carbide wafers coated with graphene. They then etched away the extra graphene surrounding the transistors, leaving a clear surface that metal inductors could stick to. The separation between the graphene transistors and the metal inductors prevented degradation of the transistor’s electrical properties. Lin’s circuits operate at 10 gigahertz. That’s much faster than previous graphene circuits but they remain less reliable than the state of the art silicon frequency mixers. Lin expects to overcome that problem in time. Additionally, they can make circuits far smaller and more efficient than existing ones. Lin’s group is also developing ways to use graphene in more complex circuits. Lin’s ultimate goal is to build an entire circuit out of an individual carbon nanotube. Yu-Ming Lin received a B.S. in physics from National Taiwan University, Taiwan, in 1996. He then earned a masters and a PhD in electrical engineering and computer science from MIT in 2000 and 2003, respectively. At MIT, his work focused on thermoelectric properties of Bismuth-based nanowires, using a non-lithographic self-assembly process. 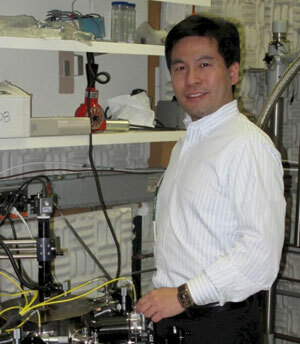 Lin has joined the IBM T. J. Watson Research Center in 2003 where he is currently a Research Staff Member in the Physical Science department. His research at IBM focuses on the exploration and application of novel nanoscale electronic devices. Yu-Ming Lin is an IBM researcher who has led the development of an integrated circuit using a superast graphene transistor.